So amazingly enough... I've reached 1500 followers here on the blog. I wanted to give away some awesome upcoming releases that I'm SO excited about. 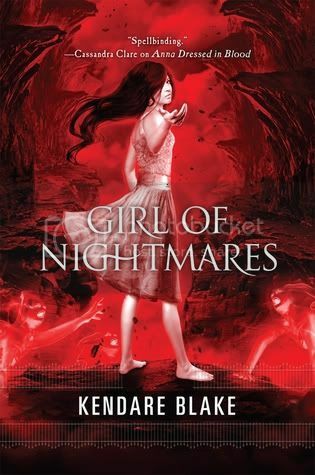 Today's giveaway is for Girl of Nightmares by Kendare Blake! By entering this giveaway, you agree to the terms listed above. That's it guys! And keep checking back this week for more awesome prizes. Definitely excited about this book finally coming out. :) Thanks for the awesome giveaway. Yup! Actually still reading Anna Dressed in Blood--weekend got busy and haven't really had the chance to read more--and I am really enjoying it! Cannot wait to see how this one ends and wait for the next one! Congratulations on the 1500 followers! Totally deserved as you have a wonderful blog. thanks for this great giveaway! I can't wait to read this one and I'm curious about the whole series. Congrats for the 1500 followers! I SO am!! Thanks for the giveaway! And thanks for having a great blog!! WOOT! Congratulations! Can't wait for Girl of Nightmares--the first one was soooo good. Very excited! Congrats and thanks for the giveaway! I'm really excited for this book. I loved Anna Dressed in Blood. Congrats on the followers & thanks for the giveaway! A friend of mine adored Anna Dressed in Blood and got me reading it. Can't wait to see what happens! Congrats!! I can't wait to read this book! Thank you for the giveaway! I am literally dying to read this ASAP. Congrats! Yes I am so excited for this sequel! I have no idea what to expect and I am looking forward to finding out! Thanks for the giveaway! YES! The last one was amazing and I love the cover for it just as much as the first one! Congrats on 1500 followers! Thanks for the amazing giveaway! I can't wait for this book!!! I *need* it! So. Badly. CONGRATS :D:D That is awesome. :) Also, I adore your blog. <3 *Hugs. * I CANNOT wait for Girl of Nightmares! It will be epic. I loved the first one so so so much. <3 Ah. So excited. :) Thank you for this awesome giveaway. I'm super excited! :) Also, major congrats on reaching so many followers! I absolutely adore your blog and can't wait to keep reading it all the way to a million followers. I'm totally pumped for it! :) Also, major congrats on reaching so many followers! You're one of my favourite blogs and I'm so excited to stay with you all the way to a million followers. Congrats on this blog milestone! I still need to read Anna Dressed in Blood! Congrats on all the followers! I am excited, I just got Anna Dressed in Blood but I can already tell that I'm gonna love it. Thanks so much for the giveaway! Can't wait for this book! The cover looks great! A friend gave me the first one and we cannot wait now for book 2! Congrats on your achievement and thanks for the awesome giveaway. This book sounds like a great read! I have never heard of this author but am always looking for new ones to enjoy. Thanks for helping to feed my book habit! i am super excited for this book! I love the cover. Ao creepy and beautidul! I'm actually listening to the first book on audio and I am loving it so far! I'm already anticipating the sequel. I love Anna Dressed in Blood, and I'm so excited for Girl of Nightmares. Hard one to call. I'm pretty stoked but you might have me beat. Still, I'd love to get a copy. Thanks! YES! Book one was amazing! I can't wait to see what happens in this one! And don't even get me started about the cover! I am stoked for this book! It even comes out on my birthday :-) Anna Dressed in Blood was fantastic! Congrats on all the followers. I still haven't read Anna Dressed in Blood yet, so I can't say I'm as excited as you are! I can't wait to read it! Thanks so much for the chance to win! YES!!! I LOVE LOVE LOVED Anna Dressed in Blood!!! I cannot wait to get my hands on Girl of Nightmares!! I am so excited about this book. Thanks for the giveaway! Yes!!! I was dying for this book when I reached the last page of Anna Dressed In Blood!! Yeah, I'm dying to read it, I loved Anna Dressed in Blood! Thanks for the giveaway & congrats on all the followers!